Lena is away for a couple of weeks and I decided to try out some new recipes while she is gone. My first meal was Chicken Sausage Gyros. I cut the recipe below in half and used flat bread instead of the pita bread. I also added a sprinkle of dill weed to the sour cream mixture. For the chicken sausage, I used Johnsonville Italian Chicken Sausage (which I got at Tom Thumb, a local grocery store here). It had a good flavor and is much better for you than regular sausage. This was super fast and even after I cut it in half it has lasted for several meals. In a large skillet coated with cooking spray, cook sausage over medium heat until heated through. Meanwhile, in a small bowl, combine the sour cream, cucumber, vinegar, oil and garlic powder. 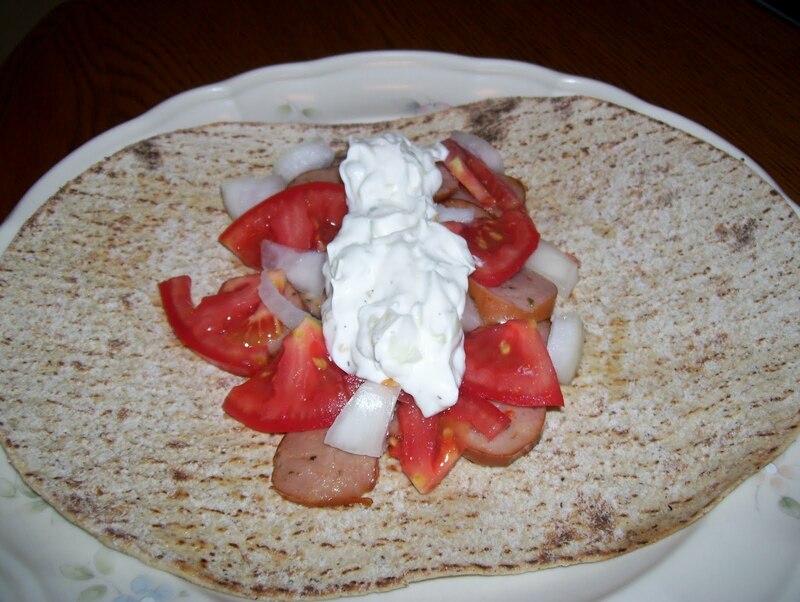 Serve chicken sausage on pita breads with tomato, onion and cucumber sauce. Yield: 4 servings.